All BADGAR rescued animals are taken to the nearest shelter to the rescue site. We avoid at all cost the movement of wildlife out of it's home area. In some cases, animals may have to be moved for rehabilitation out of their area, but they are always returned back when released. Wildlife Shelters are the unsung heroes of our community. Hard working, often unrecognised and tremendous efforts are all attributes of shelter owners and their carers. In order for somebody to become a wildlife carer, they don't need to belong to a rescue group. Caring for wildlife is a special gift and is open to anybody who has patience, love to give and a good strong heart! There are over 241 authorised Wildlife Shelters in Victoria. They are all required to operate in accordance with a Code of Practice. In a single year, over 9000 animals from 427 different species are admitted to shelters in VIC alone. Wildlife Shelters are not permitted to charge for their services, but may accept donations. The Greendale Wildlife Shelter is the home of BADGAR and sees Donna Zabinskas, one of the state's most respected shelter owners, live on site. If you would like to become a wildlife carer, call us on 03 5368 1501 and we will put you in touch with a shelter near you. It's at the shelter's discretion as to whether or not a carer is capable of taking on animals. You will all no doubt have hands on training and make a family of your new friends! Please consider your local shelter when making donations of materials, foods and time. They'll really appreciate your efforts. 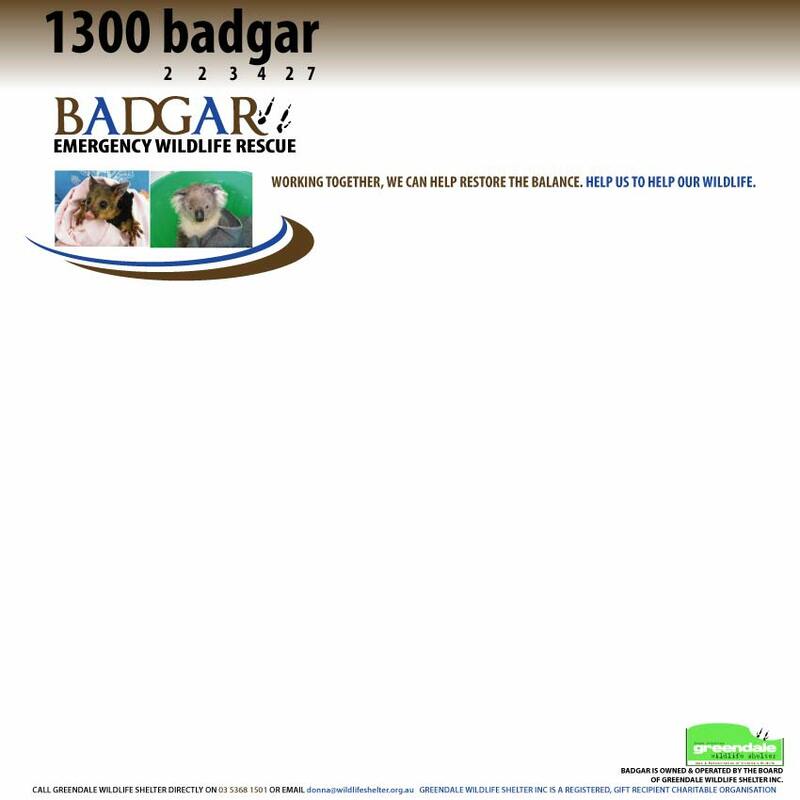 Remember, the 1300 BADGAR line is for emergencies only, so EMAIL us or call us for more information in your area.